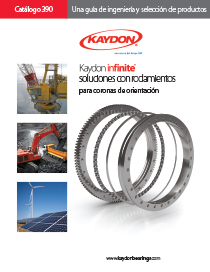 Muskegon, Michigan, USA...Kaydon Corporation Bearings Division has released a Spanish-language edition of its slewing ring bearing catalog, to better serve its customers around the world. Engineers can download a PDF version on the Kaydon downloads page; request a free printed copy; or call Kaydon toll-free at 800.514.3066. The comprehensive catalog contains easy-to-use tables with updated specifications and dimensions for Kaydon's extensive line of slewing ring bearings, as well as load charts and cross-sectional drawings. It also features installation and maintenance tips, an expanded remanufactured bearings section, and more reference information, including a handy metric-English conversion factors guide. The PDF version is especially user-friendly, with links that take the reader right to the page he or she needs. Both versions include a worksheet that can be sent to Kaydon for a free, customized application engineering review and recommendation.